I did an analysis of my Vancouver photographs looking at streaks of outings with no first-rate photographs. The streaks were longer than I expected, but that can be attributed to the whims of chance. My analysis of streaks re-enforced for me the importance of continuing to take photographs even if there has been a prolonged period of disappointing results. For more information on methodology see my post on Photography Analytics. I analyzed 101 Vancouver outings. There were 30 outings with one or more first-rate photographs for a probability of 0.3 (30/101). That's consistent with what I expected. Before doing the analysis, I estimated 1 in 3 outings resulted in at least one first-rate photograph. The number of first rate photographs on any given day depends on chance. It’s like flipping a coin. I know I’ll get heads or tails on each flip. I also know that I might get several heads or several tails in a row. With the photographs, I know there’s a 1 in 3 chance I’ll get 1 or more first-rate photographs on any outing. There will be streaks of consecutive outings with first rate photographs. There will also be streaks where there are no first-rate photographs for several outings in a row. This psychological expectation can play havoc with my confidence. Based on my estimate of 1 in 3, I accept not every outing will be successful and that unsuccessful outings will outnumber the successful ones by 2:1. It’s natural to expect luck to be evenly distributed. That is, there will be a successful outing followed by a couple of unsuccessful ones followed by another successful one and so on. Chance - randomness - doesn’t work that way. Rather than being the exception, streaks are the norm. Even knowing this, I still expect - or at least hope - my luck will be fairly evenly distributed. I start to feel a little hard done by if there are more than two days in a row without any first-rate photographs. If the streak extends to three days or more, it begins to feel like a mounting crisis. On the other hand, sometimes the wins come more frequently. Rather than attributing this to good luck, I start to believe I have somehow “levelled up” and will now continue to produce at a higher rate. It’s an emotional see-saw. Here are my streaks of consecutive outings where I had no first-rate photographs. A streak-length of zero means I had one or more first-rate photographs in back-to-back outings. It's tempting to think I must have been doing "something wrong" during those streaks. However, this distribution looks similar to randomly generated streaks. The streaks vary considerably with every simulation. It turns out a streak of length 8 or more is quite likely. I ran the simulation 10,000 time recording the longest streak of each simulation. 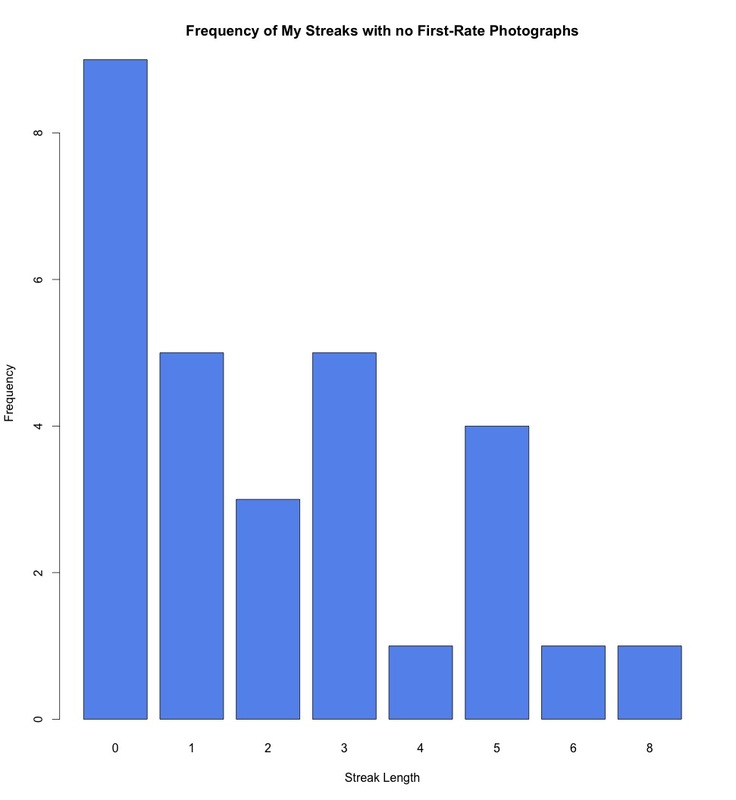 Using these simulation results, I calculated the probability of a simulation having at least one streak greater than a given length. 100% of the simulations had a streak at least 4 outings long and 69% of the simulations had a streak of 8 outings or longer. Rather than being an exception, a streak of 8 is to be expected. The expected length of streaks is dependent on the percentage of outings with one or more first-rate photographs. For example, here's what the simulation looks like if the probability increases to 0.5. Even if the odds are 50/50 of getting a first-rate photograph on an outing, there is a greater than 50% chance of having at least 5 outings in a row with no first-rate photographs. Ouch. I conclude that despite my best efforts, streaks will happen. Rather than getting discourage I just need to accept it and carry on. The photograph that preceded the streak of 8 consecutive outings without any first-rate photographs.